2010 was a good year for new coffee houses in Tacoma. 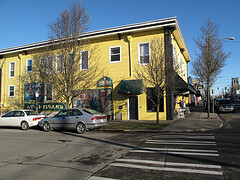 One of the best is Beyond the Bridge Cafe at 2717 6th Avenue Tacoma, WA 98406 – (253) 572-9199. My dear daughter and I went thinking at first that it was at the west end of Sixth Avenue near the Narrows Bridge, but it was more towards the center/east end of Sixth. 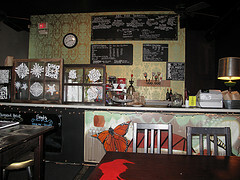 It had a unique art/coffee house feel with plenty of big comfy chairs. 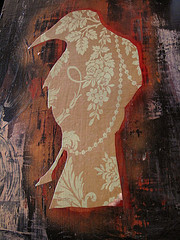 A different art bird was painted on to each of the tables and the wall also had a mural. This is the kind of place people come with their laptops and settle in for a while. The art on display made it all the more interesting and was reasonably priced. We ordered a latte for me, a vanilla Italian soda for the teen and a full monty bagel sandwich minus the bacon to share. They forgot the drinks, but felt bad about it and not only gave us our drinks but a get two free card. In addition to coffee, they offer wine and beer. The sandwich was very tasty and so were the drinks once they arrived. 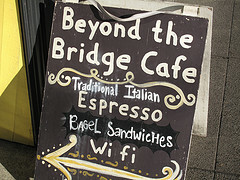 Note: I’m sad to say that Beyond the Bridge Cafe closed its doors on May 14, 2011. This entry was posted in Art -- there is art here!, Coffee Shops, cafes and bistros, Restaurants, Tacoma, Their future is in question, WA State - Pierce County and tagged 6th Ave, 6th Avenue, art, breakfast, coffee, Community, happy hour, lunch, restaurant, Sixth Ave, Sixth Avenue on December 30, 2010 by admin.